Some people may find entertaining for a vegetarian challenging, but during the summer with so many fresh vegetables available, I think it's actually really easy and satisfying. If such as guest is on your list, here's a dish that will please him or her and is hearty enough for the meat-eaters too. 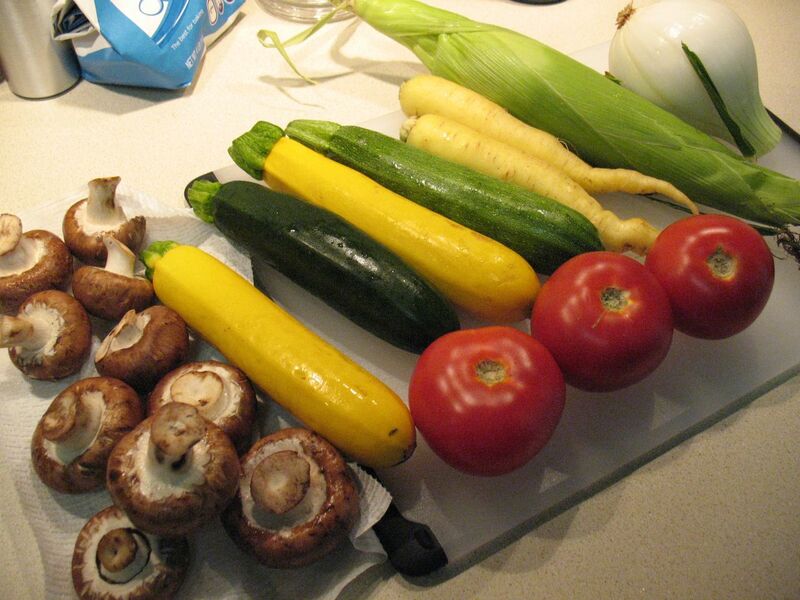 With my farmers market chock full now of so many options, I couldn't go wrong putting together a hearty combination of garlic, onions, yellow squash, zucchini, tomatoes, corn and mushrooms. To make it extra special, I went the extra mile and made the ricotta and noodles from scratch (both are worth it, and probably easier than you think). I've made pasta before, and it gets easier every time. For these noodles, I used Mark Bittman's How to Cook Everything Fresh Egg Pasta recipe, which couldn't be simpler. For the ricotta, I went with Smitten Kitchen's recipe for Rich Homemade Ricotta (see my post on making ricotta). Each of the steps in making this is pretty easy. it's just a matter of allotting enough time to get it all done. I served this with an Oregon pinot noir. 1. Position oven rack to middle and preheat oven to 400 F.
2. Heat a large deep-sided nonstick skillet or frying pan over medium heat. Add 1 tbsp. olive oil. When hot, add mushrooms and cook until browned. Remove from pan. 3. Add 2 tbsp. olive oil to pan. Add onion, yellow squash, zucchini and carrots and sauté until soft and starting to brown, about 10-12 minutes. 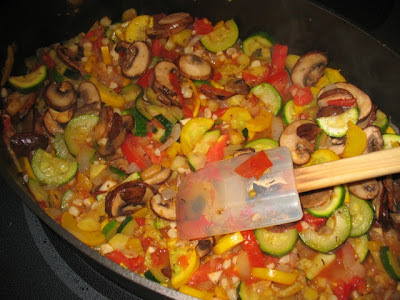 Add garlic, tomatoes and corn and cook until the tomatoes have softened and given up liquid, about 5-6 minutes. Add dried oregano, thyme, seasoned salt, pepper and vermouth. If the sauce is too thick, add additional water. Let bubble a few minutes then reduce heat to simmer. 3. 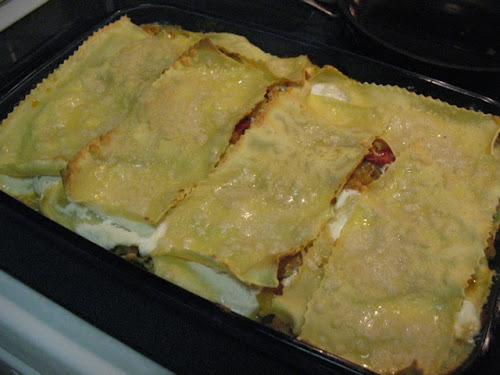 To assemble the lasagna, spray a 9 X 13 baking dish with olive oil. Lay down a small amount of sauce, then a layer of noodles, about 1/4 of the ricotta, a thick layer of sauce, and then repeat: noodles, ricotta, sauce, etc. 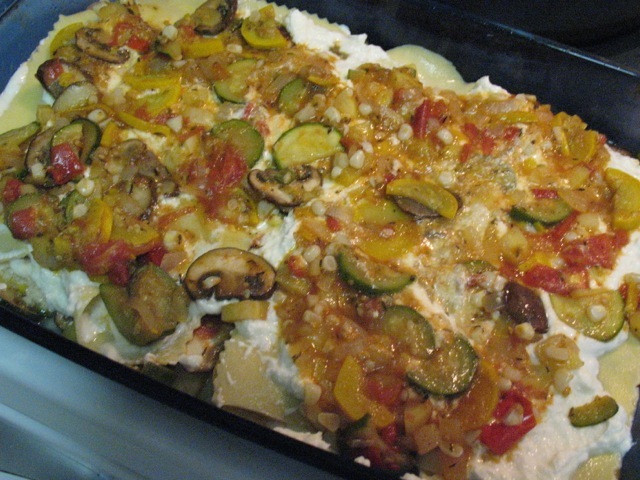 After the second layer of ricotta, sprinkle with 1/4 cup of the parmigiano-reggiano. Finish with a layer of noodles and spring that with the other 1/4 cup of parmesan. 4. Bake on the oven until heated through and the top is lightly browned, about 20-25 minutes. Allow to cool for 5-10 minutes before serving. 1. Combine flour and salt in a food processor. Add eggs all at once and process until the dough comes together in a ball. If the dough is dry and grainy, add a little bit of water. If it sticks to the side of the food processor, add more flour. 2. Turn the dough out on a floured piece of plastic wrap and knead briefly until smooth. Cover with the plastic and allow the dough to rest about 30 minutes. 3. Divide the dough into four pieces. Using a pasta machine, roll each piece out into thin layers (I used setting 5 on the Kitchen Aid mixer pasta machine insert). Cut the dough into long strips about 2 inches wide and 8 inches long. 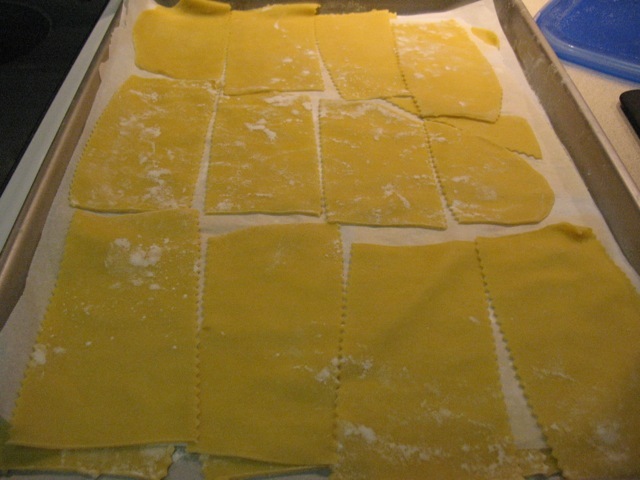 Refrigerate on a floured baking sheet until ready to use, separating single layers of noodles with parchment. 4. To cook, boil in salted water about 2 minutes (boil noodles in batches to prevent sticking and overcrowding). Yum! I love meat but didn't miss it with this dish. The perfect centerpiece for a summer dinner party. Thanks for making it honey!